One of the most successful posts on State of Search ever is this one. It is a post I actually wrote on the plane, on my iPad, because I was so annoyed with a new feature which Google launched: the blue arrows. Apparently many agree with me (and some disagree) that they are annoying for those using the arrows to scroll. Now when I’ve finally gotten used to them and a different way of scrolling (still not using the arrows though) Google decides enough is enough: they are gone. Together with that change Google also added Instant Previews to the sitelinks. 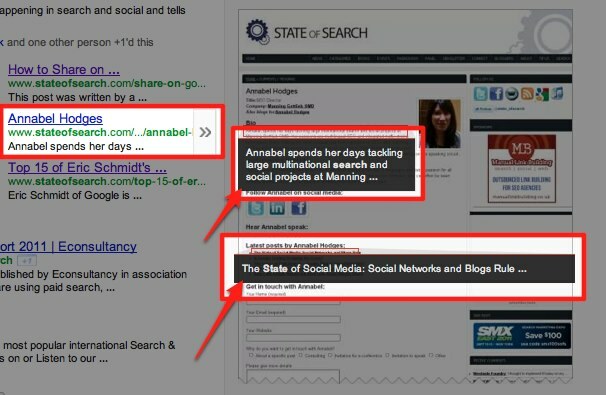 Now your sitelinks can be previewed. It also seems like Google has added some extra rich content to the previews. Let’s start with the Blue Arrows. And no, we are not talking about the giant big arrow Google used last week to point people going to google.com on their now public Google+. We are talking about the small blue arrows in front of the search results. They launched this in October 2010. It was supposedly build to speed things up, navigate through the results quicker with your keyboard, using your arrows. As said, I hated it. Google has not officially made any comments on this, but if you do a search they are clearly gone. I am not really sure if I like the new sitelinks. The blue arrow never never was a problem to me. But I must say that Google has been changing it’s SERP layout very frequently lately. However a bigger change is that they removed their cache data! For me it is always interesting to compare my crawl statistics with the date Google says it indexed my page. Is there any other way to digg up google cache information? What would be the intention of Google to remove its cache info? Is it something from the past that has gotten useless for most visitors? Or is Google trying to limit their information towards SEO people? Nice article, I love to read about all the tweaks Google is undertaking to improve on their sites. I still see the blue arrows. Can’t say I hate ‘m though, I just don’t use them. No, both in .com and .nl I still see them.